Cyanotic congenital heart disease (CCHD) usually portends poor prognosis as it reflects a more complex form of congenital heart disease (CHD). Normally, the systemic circulation and pulmonary circulation are in series and the entire blood transiting the systemic circulation finds its way to the pulmonary circulation and there is no mixing of deoxygenated blood with the oxygenated blood, except for the bronchial veins that drain to pulmonary veins (<3% of the cardiac output). Systemic circulation being the dominant circulation, maintenance of cardiac output and systemic blood pressure take priority for sustenance of life. The role of pulmonary circulation is oxygenation of blood and plays a minor role in maintaining overall hemodynamics of pressures and flows. Systemic blood flow (cardiac output) in the basal state is maintained within a narrow physiological range, maintaining optimal tissue perfusion pressure through various neurohumoral mechanisms. Pulmonary circulation does not possess such an efficient neurohumoral mechanism to limit the pulmonary blood flow and is normally controlled by the dominant systemic circulation as the two are in series. This is exemplified by the circulation in transposition of great vessels (TGA) where the two circulations can be described as in parallel. In TGA, the systemic blood flow is usually in the normal range despite hypoxemia, whereas the pulmonary blood flow progressively increases with reduction in pulmonary vascular resistance and regression of left ventricular mass and compliance. Mixing of deoxygenated blood with oxygenated blood results in cyanosis but does not increase systemic blood flow significantly. When oxygenated blood mixes with deoxygenated blood (eg., VSD), pulmonary blood flow increases and obviously, does not result in cyanosis. Though the systemic oxygen saturation is identical, the underlying hemodynamic abnormalities are vastly different. In Tetralogy of Fallot, pulmonary blood flow is reduced due to subpulmonic obstruction, facilitating right to left shunt. In VSD with Eisenmenger syndrome, pulmonary blood flow is reduced due to pulmonary vascular disease and increased pulmonary impedance, facilitating right to left shunt. In common atrium, and tricuspid atresia, both admixture lesions, the pulmonary blood flow is likely to be normal or mildly increased (equal to or mildly more than systemic blood flow), as the admixture physiology facilitates complete mixing of deoxygenated and oxygenated blood and the arterial saturation is determined by the contribution of oxygenated blood (pulmonary blood flow) to the admixture. In simple TGA, the pulmonary blood flow has to be significantly more than systemic blood flow to allow oxygenated blood to traverse atrial septal defect from left atrium (LA) to right atrium (RA) and thus improve the systemic oxygen saturation which otherwise will have only recirculating systemic venous blood. This highlights the fact that for varying degrees of pulmonary blood flow, we can obtain similar systemic arterial saturations and the hemodynamic determinants of right to left shunt, and systemic arterial saturation is different in each of these conditions. Congenital Cyanotic heart disease (CCHD) with admixture physiology is a cardiac defect which facilitates complete mixing of the deoxygenated systemic venous (SV) blood returning from the tissues and the fully oxygenated pulmonary venous blood from the lungs in a common receiving chamber. As the mixing of the deoxygenated SV blood and the fully oxygenated pulmonary venous blood is a simple physical process, the resultant mix of blood will have saturation somewhere in between that of SV and pulmonary venous blood oxygen saturation. When mixing is complete, the resultant oxygen saturation will depend on the relative contribution of the amount of blood from each circulation. As discussed earlier, the systemic blood flow is maintained within a narrow physiological range in the basal state. Assuming the cardiac index to be within the normal range, the effective saturation of the completely admixed blood will be linearly related to the amount of oxygenated blood from the lung (pulmonary blood flow). Therefore, the systemic arterial saturation in an admixture cardiac defect will reflect the pulmonary blood flow. (85-60)/(100 - 85) = 25/15 = 1.67 : 1. Let us assume that SV saturation in the above example is 70%, indicating a lesser arterio-venous oxygen difference and also reflecting a higher systemic flow. The Qp/Qs = (85-70)/100-85 = 15/15 = 1. This example highlights the importance of obtaining the SV saturation as well as the systemic arterial oxygen saturation in calculating flow ratios to compute pulmonary to systemic vascular resistance (SVR) ratio and limitations of aortic oxygen saturation taken in isolation as an indicator of pulmonary blood flow. For identical aortic oxygen saturation, reducing SV saturation will in effect increase the calculated pulmonary to systemic blood flow ratio. Applying the same logic, if the aortic saturation in a patient with single ventricle with PS is 90% and systemic saturation is 70%, then pulmonary blood flow to systemic blood flow ratio is 2 : 1, indicating increased pulmonary blood flow. Calculation of pulmonary vascular resistance (PVR) requires minute oxygen consumption (VO 2 ) and hemoglobin concentration, the pulmonary artery (PA) pressure, and pulmonary blood flow. Though the admixture cardiac lesions facilitate complete mixing in a common chamber, this is often not the case. This can result in two scenarios. The pulmonary venous return can preferentially stream into the aorta (AO) precluding complete admixture and result in higher oxygen saturation in the AO than the PA. This is described as favorable streaming. Conversely, the pulmonary venous return can selectively enter the PA resulting in higher oxygen saturation in PA than AO. This can be described as unfavorable streaming. Thus, it is apparent that for identical pulmonary blood flow, the systemic arterial oxygen saturation can vary considerably depending on the streaming in the common mixing chamber. 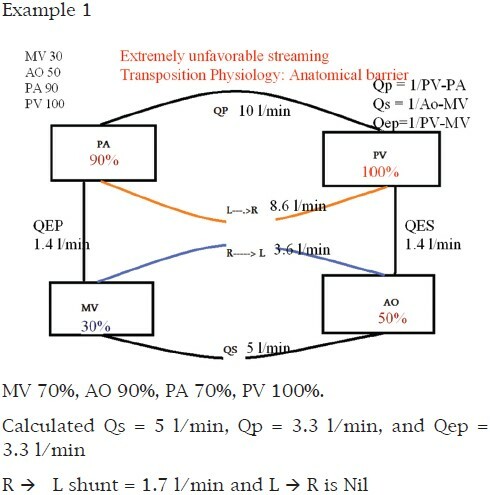 The relationship of arterial oxygen saturation to pulmonary blood flow is influenced both by the total pulmonary blood flow and the type and degree of streaming in the mixing chamber. Cardiac catheterization and hemodynamic study is often necessary for assessing PVR and operability. The common CCHD with admixture physiology include totally anomalous pulmonary venous connection (TAPVC), atresia of one of the atrioventricular valves (Tricuspid atresia, mitral atresia), single ventricle physiology (double inlet ventricle), semilunar valve atresia (pulmonary atresia including hypoplastic right heart syndrome, aortic atresia including hypoplastic left heart syndrome), double outlet RV or double outlet LV, complete deficiency of atrial septum as in common atrium, and complete deficiency of conotruncal and trunco-aortic septum as in truncus arteriosus. Regardless of the site of drainage of the pulmonary veins (PVs), the RA acts as an effective mixing chamber. Typically, the RA, RV, PA, LA, LV, and aortic oxygen saturation will be identical. This will also mask any shunt downstream from the RA, as the saturations are identical in the upstream chambers, RA, and LA and additional step up or step down in saturation cannot occur. Assuming complete admixture and assuming normal systemic cardiac output, the aortic saturation will indirectly reflect the pulmonary blood flow. Alternately, if the aortic saturation is very low, then it indirectly indicates decreased pulmonary blood flow and hence pulmonary vascular disease. Conversely, if the pulmonary blood flow is markedly increased, then the aortic saturations can be as high as 90% and cyanosis may be missed. It is not uncommon to make a clinical diagnosis of ASD as all other clinical features are like a large left to right shunt ASD and the minimal cyanosis can be missed. It should be noted that only a minority of TAPVC remain asymptomatic and present like an ASD, as majority will have some anatomic or functional obstruction to the anomalous channel resulting in pulmonary venous hypertension early in life. Only 50% of TAPVC survive 3 months and 20% survive one year without surgery. Interestingly, when TAPVC is associated with conditions like pulmonary atresia and complete endocardial cushion defect as in visceral heterotaxy (two admixture lesions in tandem), the clinical picture is dominated by the second lesion and TAPVC may be overlooked unless special care is taken to identify the pulmonary venous drainage. This is important when Glenn shunt is planned as TAPVC will interfere with rerouting of SVC to PA. When TAPVC, an admixture lesion, is associated with TGA, it may be beneficial as complete admixture of oxygenated and deoxygenated blood will mitigate issues of lack of mixing, so characteristic of TGA. In the other pretricuspid admixture lesions, like common atrium, TAPVC to RA and tricuspid atresia, streaming has not been well characterized. Patients with univentricular hearts characteristically have a complete mix of systemic and pulmonary venous circulations at the ventricular level. If one assumes a pulmonary venous oxygen saturation of 100% and normal systemic blood flow (cardiac output), the arterial oxygen saturation will reflect pulmonary blood flow. As a rule of thumb, values 85% and <75% signify increased and decreased pulmonary blood flow, respectively. An adult with body surface area, 1.6 m 2 and assumed VO 2 , 200 ml/min; Hb, 14.75 gm%, with a cyanotic heart disease is the hypothetical patient. 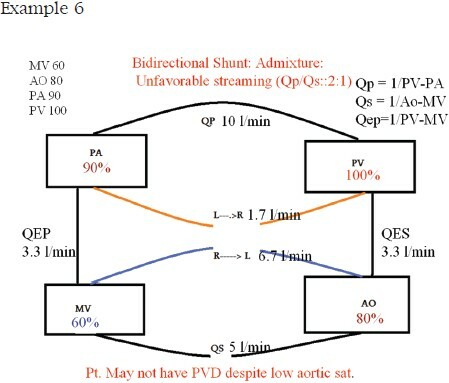 To calculate the various flows, we need the oxygen saturation in AO, PA, PV (often assumed as 100% or fully saturated), and SV or mixed venous (MV) saturation (obtained as the average of three SVC and one IVC saturation). 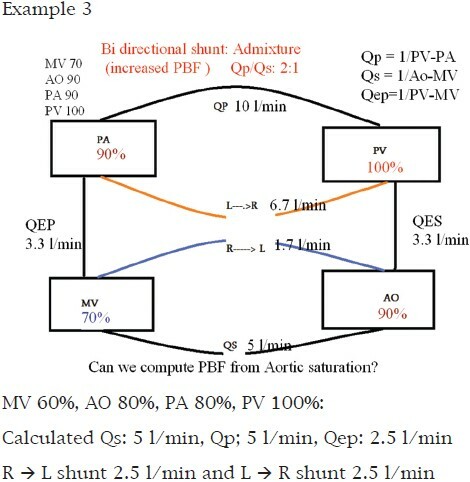 The following examples will have AO, PA, PV, and MV saturations, and with the VO 2 and Hb% already given, we will proceed with calculation of the flows and interpretation. 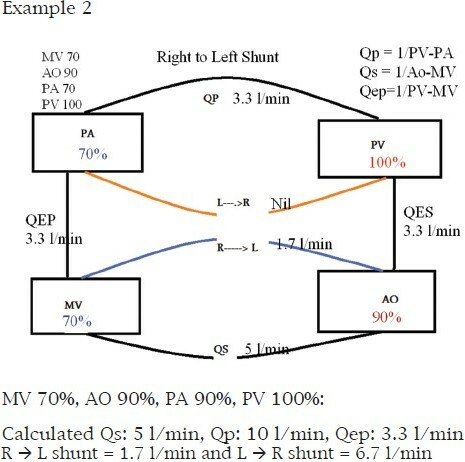 Please note that the O 2 saturation difference between the AO and MV is kept at 20% to maintain normal systemic blood flow (cardiac output) and PV assumed as 100%, excluding any pulmonary cause for PV desaturation. Discussion: There is systemic desaturation, but the aortic saturation is significantly more than the PA saturation. This is the typical oximetry run of simple Tetralogy of Fallot. There is no left to right shunt and only a right to left shunt. Thus, a simple TOF is not an admixture lesion. However, TOF with AO to pulmonary shunt, pulmonary atresia with VSD, and TOF with major AO to PA collaterals will have bidirectional shunt. Among the conditions which are grouped as TOF physiology with large VSD and subpulmonary obstruction (DORV with PS, TGA with PS, single ventricle with PS, and corrected TGA with PS), only corrected TGA large VSD and severe PS will closely simulate the oximetry of TOF. Discussion: The oximetry run reveals equal aortic and PA saturation typical of an admixture lesion. This is seen in patients with TAPVC, common atrium, single ventricle, and truncus arteriosus. The high saturation in the AO at 90% indicates significantly increased pulmonary blood flow (twice the systemic), as evident by the flow calculations. Thus, the PVR is less than half of SVR. In truncus arteriosus, this may indicate a favorable PVR for surgical correction. Discussion: The oximetry data show identical aortic and PA saturations and hence is an admixture lesion. This can be seen in conditions like TAPVC, common atrium, truncus arteriosus, and single ventricle. The aortic saturation is low and the pulmonary blood flow is reduced. In conditions where PA pressures are expected to be at systemic levels as in truncus, single ventricle (without PS), low aortic saturation suggests pulmonary vascular disease and hence high surgical risk. Pretricuspid admixture lesions like TAPVC in the absence of obstruction and common atrium behave like large ASD with progressive increase in pulmonary blood flow with progressive reduction in RV hypertrophy and improved RV compliance in infancy. In later age, if pulmonary blood flow is reduced to the same level of systemic blood flow, it is almost always due to increased PVR and RV hypertrophy and reduced RV diastolic compliance. These data would indicate poor surgical outcome because of pulmonary vascular disease. Examples 2 and 3 highlight the importance of systemic arterial saturation, easily determined by pulse oximetry, in assessing pulmonary blood flow and indirectly the pulmonary resistance. Clinical correlation is important to determine the site of increased pulmonary resistance: at the peripheral vascular level (pulmonary vascular disease) or proximally at valvular, supravalvular, or subvalvular level (sub pulmonic stenosis). The oximetry data are of a patient with DORV and subaortic VSD which is considered as an admixture lesion. However, depending on the location of the VSD, favorable or unfavorable streaming of oxygenated blood occurs in patients with DORV. These data demonstrate favorable streaming, with aortic saturation significantly higher than PA saturation. However, the pulmonary blood flow is just equal to the systemic blood flow. In DORV without PS, the PA systolic pressure equals systemic systolic pressure and hence this would indicate severe pulmonary vascular disease despite a high aortic saturation. Note that despite high systemic oxygen saturation, if favorable streaming is present, pulmonary blood flow may be low and PVR may be high in an admixture lesion. The oximetry data are of a patient with DORV and subpulmonic VSD (Taussig Bing defect). Though DORV is an admixture lesion, when the VSD is subpulmonic in location, pulmonary venous return gets pumped into PA from the LV resulting in unfavorable streaming. It results in poor systemic saturation despite good pulmonary blood flow. Though the aortic saturation is low, the PVR will be lower even when the PA systolic pressure equals the systemic arterial systolic pressure because the pulmonary blood flow in this patient is twice the systemic blood flow (PVR/SVR ratio <= 0.5). Examples 4 and 5 demonstrate the effect of favorable streaming and unfavorable steaming on systemic arterial saturation as well as the PVR. This often will call for detailed hemodynamic study with pressures and flows to assess PVR and surgical operability. This discussion will not be complete without citing an example of TGA. The O 2 saturation in PA is far higher than in the AO. Though it reflects the most unfavorable streaming, the TGA anatomy with the great arteries arising from the opposite ventricles facilitates all the pulmonary venous return to reenter the PA (physiological left to right shunt) and the SV return to AO (physiological right to left shunt). The low Qep is the shunt across the atrial septal defect which is bidirectional and necessary for survival. CCHD with admixture physiology accounts for nearly 50% of all cyanotic CHD. 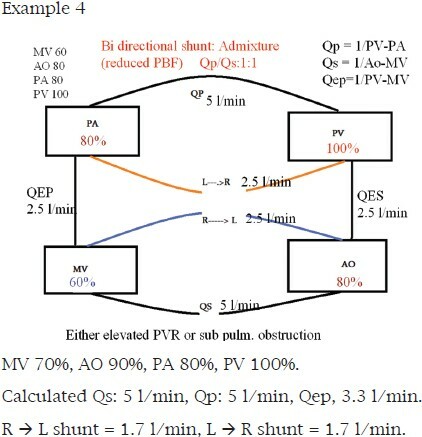 Proper assessment of hemodynamics of admixture lesions require SV (mixed venous), pulmonary venous, aortic and PA oxygen saturation and pressures to calculate flows and pulmonary resistance. The aortic saturation reflects the amount of pulmonary blood flow, but streaming is an important component of admixture lesions resulting in minor to significant difference between aortic and PA saturation. In admixture lesions wherein the pulmonary and systemic vascular bed form resistance in parallel, flow into the two vascular beds is determined by the resistance in the two vascular beds and manipulation of individual resistance (systemic or pulmonary) can be used therapeutically to optimize cardiac output and systemic oxygen delivery. 1. Burchell HB. Total anomalous pulmonary venous drainage: Clinical and physiologic patterns. Proc Staff Meet Mayo Clin 1956;31:161-7. 2. Hagler DJ. Double outlet Right Ventricle and Double outlet left ventricle in Moss and Adams, Heart disease in infants, children and adolescents. In: Allen HD, Driscoll D, Shaddy RE, Feltes TF. Netherland: Wolters Kluver; 2008. p. 916. 3. Sridaromont S, Feldt RH, Ritter DJ, Davis GD, Edwards JE. Double outlet right ventricle: Hemodynamic and anatomic correlation. Am J Cardiol 1976;38:85-94. 4. Walter H, Pacifico AD. Double outlet ventricles, In: Mavroudis C, Backer CL editors. Pediatric Cardiac Surgery. 2nd ed. United States: Mosby; 1996. p. 316-8. 5. Kouchoukos NT, Blackstone HE, Doty DB, Hanley F, Karp R. Total anomalous pulmonary venous connection In: Kirklin and Barrat-Boyce Cardiac Surgery. 3 rd ed. Philadelphia (US): Churchill Livingstone; 2006. p. 7589. 6. Gathman GE, Nadas AS. Total anomalous venous connection: Clinical and physiological observations in 75 pediatric patients. Circulation 1970;42:143-54. 7. Hagler DJ, Edwards WD. Univentricular Atrioventricular connection, in Moss and Adams, Heart disease in infants, children and adolescents. In: Allen HD, Driscoll D, Shaddy RE, Feltes TF. Netherlands: Wolters Kluver; 2008. p. 1139. 8. Keane JF, Fyler DC. Single ventricle in Nadas' Pediatric Cardiology, In: Keane JF, Lock JE, Fyler DC. 2 nd ed. Netherlands: Elsevier; 2006. P. 767-91. 9. Cabalka AK, Edwards WD, Dearani AJ. Truncus Arteriosus, in Moss and Adams, Heart disease in infants, children and adolescents. In: Allen HD, Driscoll D, Shaddy RE, Feltes TF. Netherlands: Wolters Kluver; 2008. P. 916. 10. Keane JF, Fyler DC. Truncus Arteriosus in Nadas' Pediatric Cardiology, by Keane JF, Lock JE, fyler DC, 2 nd ed. Netherlands: Elsevier; 2006. P. 767-91. 11. Kouchoukos NT, Blackstone HE, Doty DB, Hanley F, Karp R. Truncus arteriosus, In: Kirklin and Barrat-Boyce Cardiac Surgery. 3 rd ed. Philadelphia (US): Churchill Livingstone; 2006. p. 1219. 12. Tweddel JS, Hoffman GM, Ghanayen NS, Frommelt MA, Musatto KA, Berger S. Hypoplastic left heart syndrome. Moss and Adams, Heart disease in infants, children and adolescents. In: Allen HD, Driscoll D, Shaddy RE, Feltes TF, editors. Netherlands: Wolters Kluver; 2008. p. 1013. 13. Grifka RG. Cardiac catheterization and angiography, in Moss and Adams, Heart disease in infants, children and adolescents. In: Allen HD, Driscoll D, Shaddy RE, Feltes TF, editors. Netherlands: Wolters Kluver; 2008. p. 220. 14. Mavroudis C, Backer CL, Idriss FS: Ventricular septal defect. In: Mavroudis C, Backer CL, editors. Pediatric cardiac surgery, 2 nd ed, United States: Mosby; 1996. p. 209. 15. Kouchoukos NT, Blackstone HE, Doty DB, Hanley F, Karp R. Tricuspid atresia In: Kirklin and Barrat-Boyce Cardiac surgery 3 rd ed. Philadelphia (US): Churchill Livingstone; 2006. p. 1161.